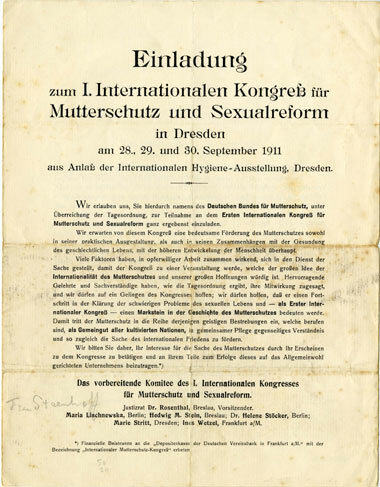 The First International Conference on the Protection of Mothers and Sexual Reform was held from 28 to 30 September following on the Fourth International Neo-Malthusian Conference, both on the occasion of the Internationale Hygiene-Ausstellung (International Hygiene Exhibition) in Dresden, 1911. Rutgers's name appears on the programme as a lecturer on maternity benefits and discussant on sexology and sexual reform. Read the invitation to the Mutterschutz conference.